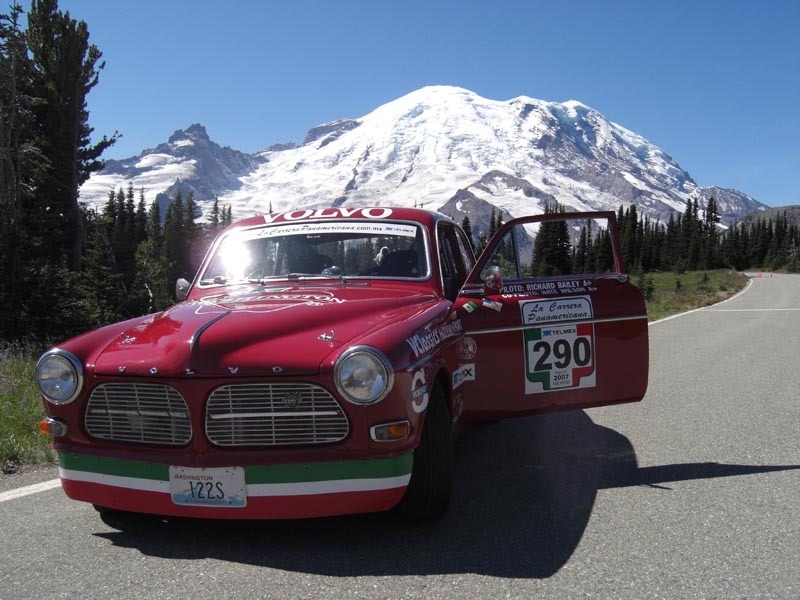 The Apple Farmer Racing Volvo 122S entered the 2007 running of La Carrera Panamericana in minimally prepared form, and dropped out partway through with engine problems. 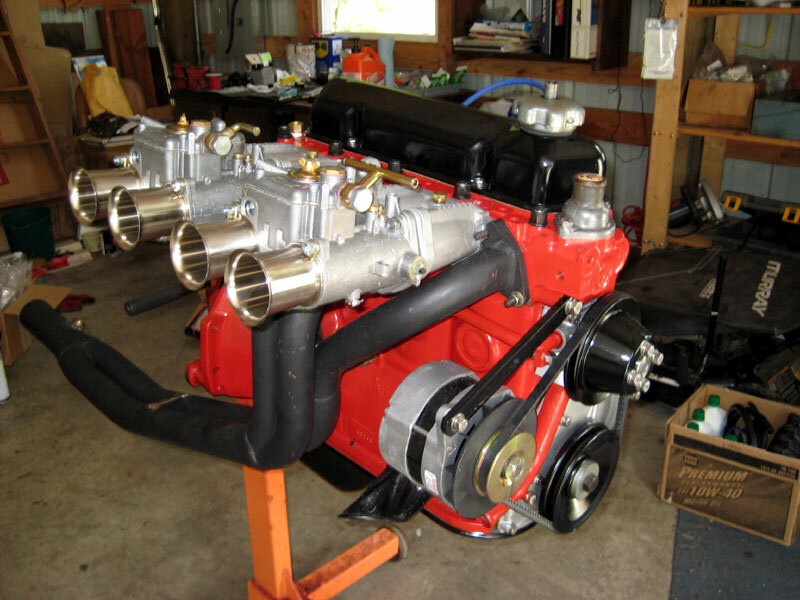 Upon returning to Washington State, owner and driver Richard Bailey initially contacted me about building two engines for the 2008 event, in case similar failure made a spare necessary. As we discussed the project over the next few days, it became apparent that the car had inadequacies in other areas, and an alternate plan soon emerged: Let's build one really strong engine that would be unlikely to break, improve everything else, and leave the spare engine for last as budget and time constraints permitted. The basic requirements for any racecar are simple enough. First, it has to keep the driver safe in the event of a crash; second, it has to be durable enough to finish the race; and third, it has to be fast enough to stand a chance of winning its class. However, the devil is in the details, and engineering a car for La Carrera is quite different from anything I'd done. The odds of having a high-speed wreck are much greater than for a track racer, so the safety aspect cannot be over-emphasized. A vintage racer typically runs five or six twenty-minute sessions in a weekend, and this car needed to endure 2000 miles of pounding over seven long days. The engine had to be tractable enough to drive in urban traffic, make power over a huge range of elevations, and run on 92-octane unleaded Pemex gas. 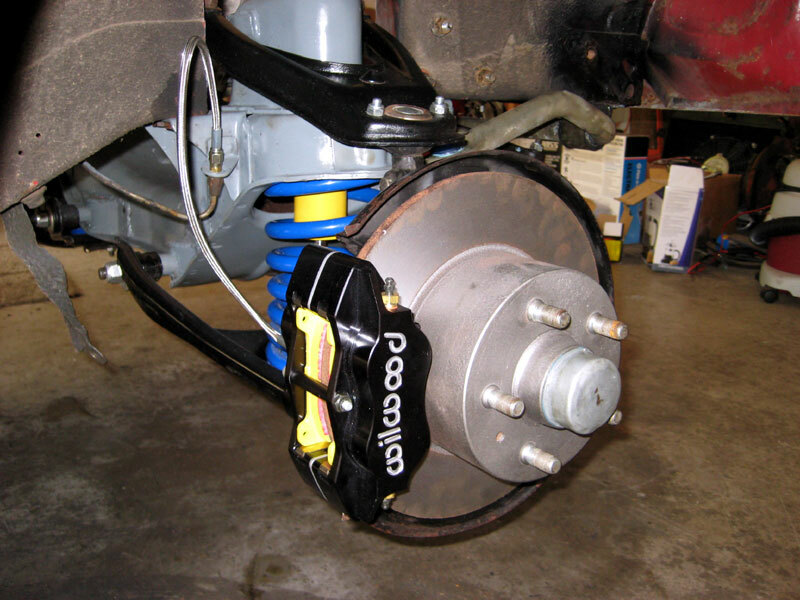 A track-type suspension wouldn't offer enough ground clearance or handle well on rough pavement, and would beat up the occupants (who also have to be durable enough to get to the finish). Over the course of the project, I did a lot of research, solicited opinions from anyone who was likely to have good ones, and still ended up making more semi-educated guesses than I was comfortable with. I'm fortunate to have extremely talented help. 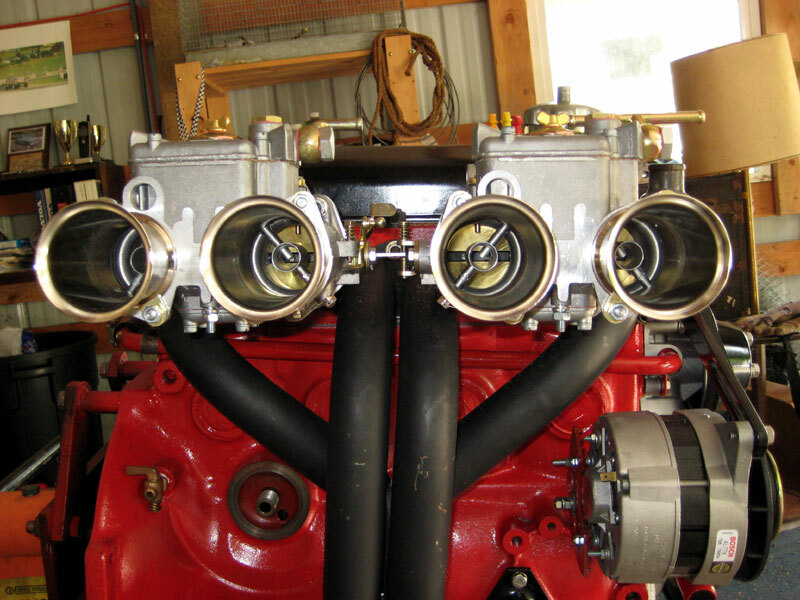 Ed Trihey, of Ed's Automotive Machine & Dyno Facility in Mukilteo, WA, is a superb machinist and builder of winning racing engines of all sorts. 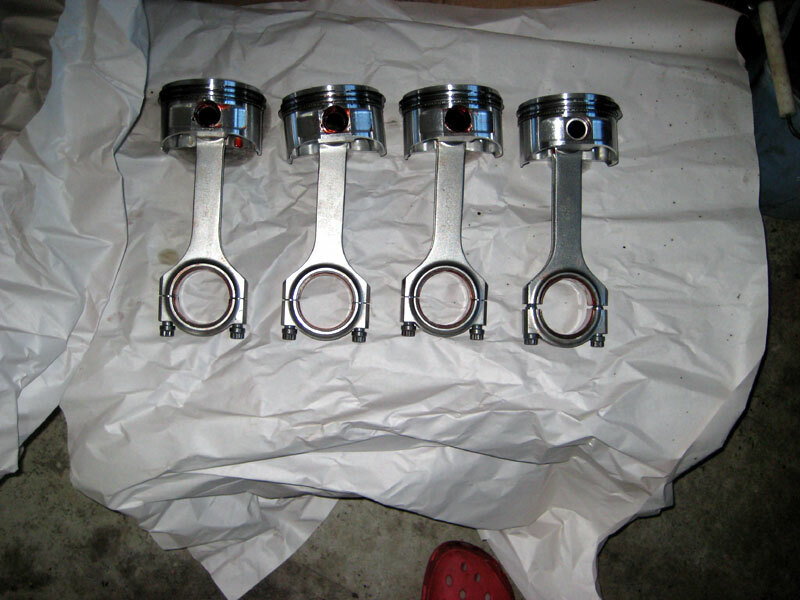 Old Volvo pushrod engines are inherently very strong, but what kills them in racing conditions is high oil temperature - all that bearing surface that makes them last forever in street use generates a lot of friction, and friction generates heat. Therefore, Ed sent the crank out to a specialist to have the rod journals narrowed. The crank was welded, index ground, and finally nitrided for additional strength. This allowed us to use off-the-shelf H-beam rods from Eagle originally meant to fit a Corvette LS1, and Ross Racing Pistons made up a custom set to fit the rods. Using these stronger parts took a lot of rotating and reciprocating mass out of the engine as well as reducing friction. 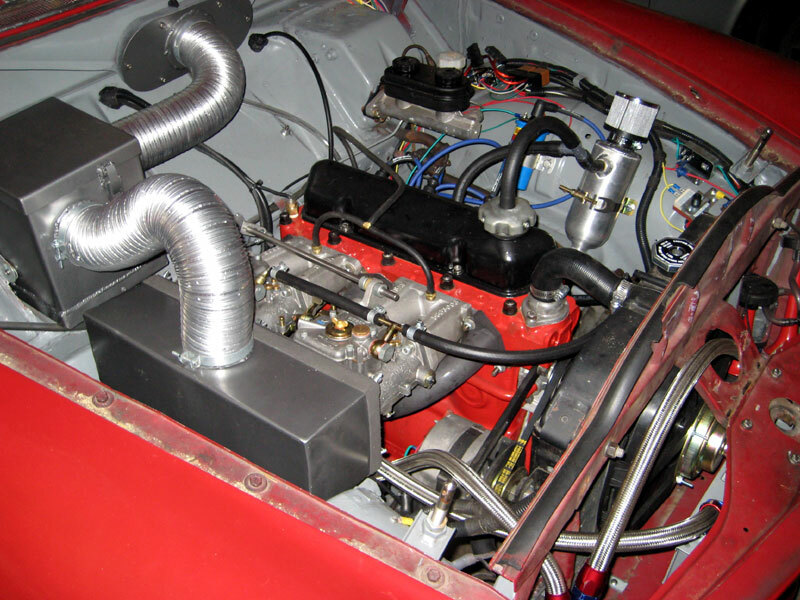 Ed fitted the head with the largest possible stainless intake and exhaust valves in bronze guides and with exhaust seat inserts for unleaded gas, modified the combustion chambers, and did a great job of porting it. Schneider Racing Cams custom-ground a relatively mild one, the object being to have a very wide torque curve rather than higher peak numbers. On my end, I procured a steel and aluminum timing gear set from Cloyes, lifters, pushrods, double valve springs and retainers from Isky, an 8.5 pound aluminum flywheel and Swedish 4-2-1 header from OJ Rallye Automotive, and Vintage Performance Developments provided ARP hardware and a pair of Misab intake manifolds to hang Weber 48DCO/2SP side-draft carbs on. The carbs came from Weber Carbs Direct, linkage parts and a few other Weber-related bits from Pierce Manifolds. IPD sent the rest of the standard rebuild parts, and a modified oil pump. Once Ed was done with his part, I did a test assembly of the crank and pistons, took some measurements, and then has F&S Machine in Oak Harbor, WA do the final block decking and head shaving to produce 11.0:1 static compression. 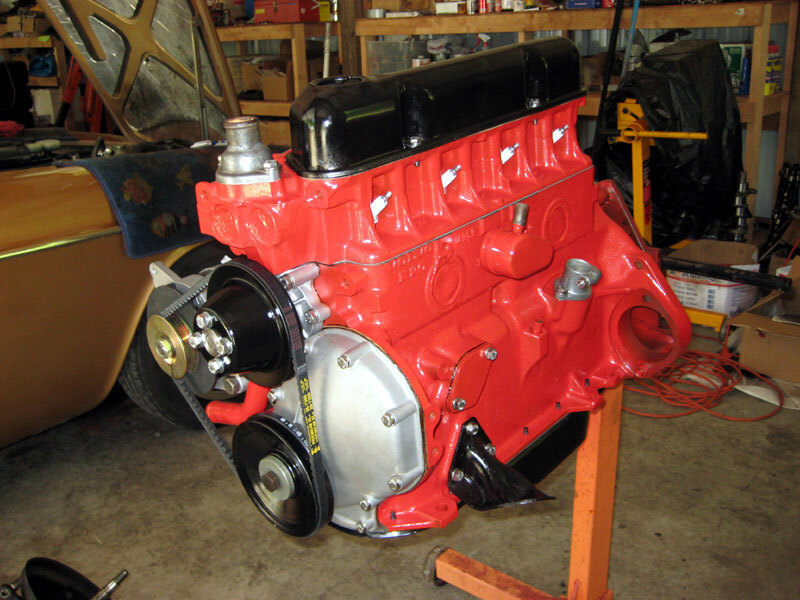 I then assembled the engine over several days, spent most of another day porting the intake manifolds, and did a lot of grinding on the carbs, manifolds and header until they agreed to get along with one another. With the engine finally completed, Ed and I spent two days breaking it in and tuning it on his engine dyno. At the end of that, it was making 168 foot pounds torque and 163 horsepower (both SAE corrected) - not stellar peak numbers, but with a very wide, flat torque curve, which is what I wanted. Acceleration is a function of the area under the torque curve, so I was sure that would go pretty well. Towards the end, we were bouncing it off of the 7500 RPM rev limiter regularly, so I was sure Richard wouldn't be hand-grenading it. Power would come up a bit more with more running, and I figured it should be good for 125 MPH on long straights, which is about as fast as I'd care to push a 122S through the air. My other essential help is Mike Deilke of Techstyles, who did a huge amount of fabrication work on the car. His business is prototyping all sorts of gadgets, largely for aerospace, and he can do pretty much anything with metal, fabric or plastic. As the car came to us, the roll cage offered no protection in case of a frontal crash, and little side protection. Mike moved a bunch of bending, cutting and welding equipment into my shop (can't beat that for service), and roughly doubled the amount of tubing in the cage to rectify those defects. 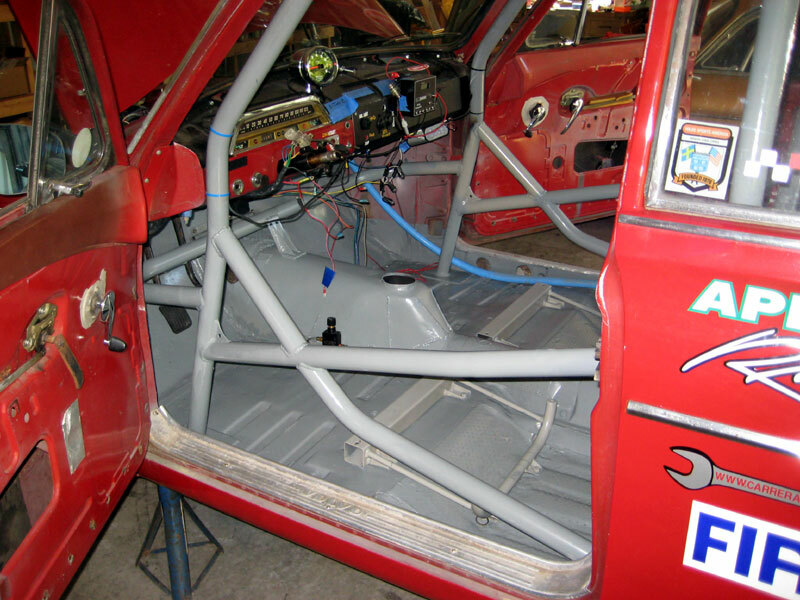 We extended sections through the firewall and tied them onto the unibody box sections, both to strengthen the cage and to stiffen the chassis. 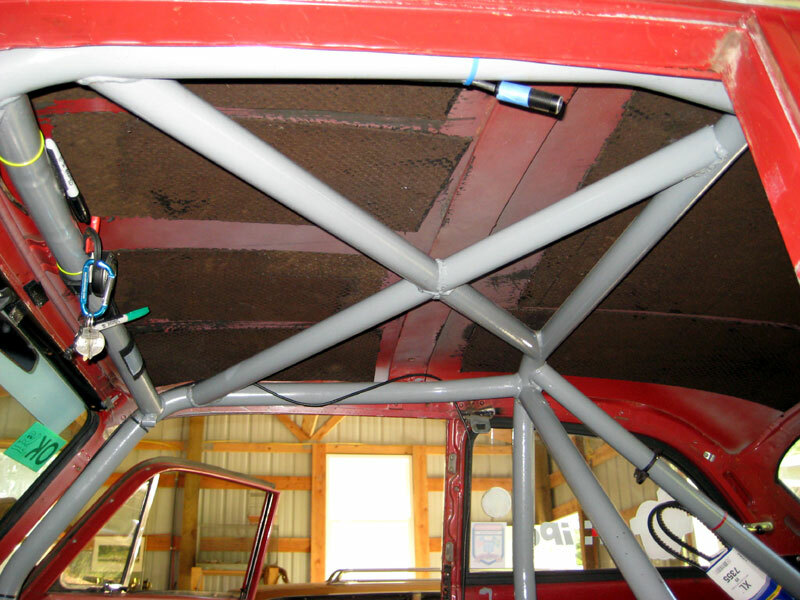 Mike added a tube across the car under the dash and tied it to the transmission tunnel, and added more bracing to the sides and top of the existing structure. The rear struts already ran into the trunk and we couldn't add more there without making the mandatory spare tire impossible to get in, so we decided that was okay the way it was. Not okay was the fact that the trunk was not sealed from the car's cabin. On a 122S, the space above the rear wheel wells is open to the interior of the car (which is not apparent with the original upholstery and insulation in place), and a cardinal safety point in a racecar is to separate the occupants from the fuel cell, which in this case was an unarmored plastic tank that wouldn't stand up well in the car were rear-ended. Mike fabricated panels to fill the big openings, and I did a lot of work with butyl body putty to close off smaller holes. 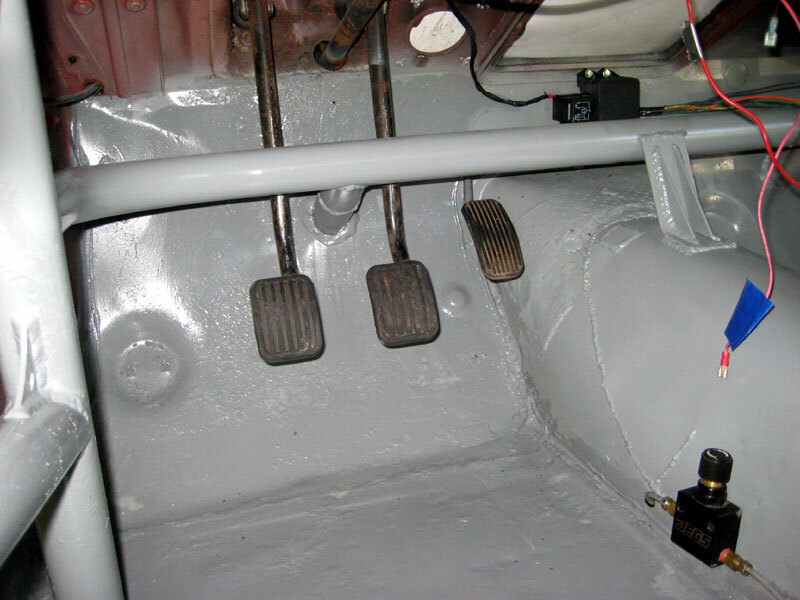 The car had the later-style steering column, which has bushings designed to separate if a collision forces the steering box towards the rear, and not force the steering wheel into the driver along with it. That's great, but it also separates if the steering wheel is pushed forwards, and it was all too easy to do just that in this particular case. Richard had had that happen in 2007, and had patched it temporarily with fuel hose clamps on the bushings. Mike made up a hefty steel collar to make the wheel stay put no matter what, and that problem was fixed. The suspension needed a lot of help. The only good thing was that the car already had Bilstein shocks and a 1 1/8" IPD front sway bar, which we retained. Most bushings were completely shot. The worst part were the catastrophic aftermarket springs, which are marketed as a performance upgrade, but are in fact softer than stock. Two of them had started to collapse, even though they were new in 2007. 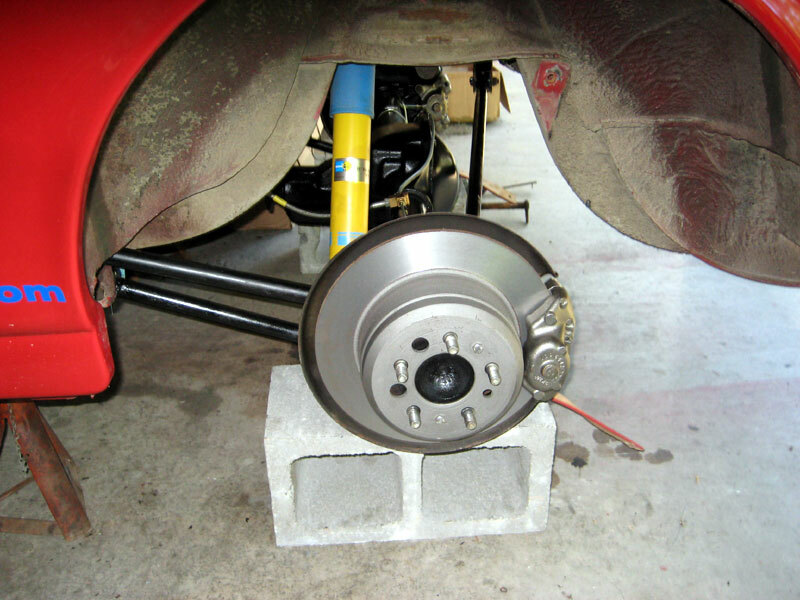 I took the entire suspension off the car, including the front cross member, and had Mike reinforce the known weak points: the shock towers, lower control arm pivots, engine mount brackets, and sway bar end link tabs. Another weakness was the original tapered rear axles, which are prone to snapping off under racing stresses. I replaced the entire rear end with one from a '71 1800E, which is much stronger and has disk brakes instead of drums. It also accepts a readily available limited slip differential, which is next to impossible to find for the drum brake rear ends. Randy's Ring & Pinion in Everett, WA, rebuilt the replacement axle, changed the gearing from 3.91:1 to 4.30:1, and installed the limited slip. I made up some new brake lines, and the rear end was ready to install. The bolt circle for the wheels is different on the disk axles, and I expected Randy's to be able to drill the hubs and fit sit studs to match the original pattern, but that was not possible. I'd just have to use 1800E rotors on the front so all the wheels would match, and that's a bolt-up swap. The downside is that we'd have to get new wheels, but I wasn't too enamored of the old ones anyway. Volvo offered an overdrive transmission as a factory option, and having an overdrive gear struck me as a necessity for La Carrera, so the old four-speed had to go. I chose the 4.30:1 gears with this in mind - that would give us the top speed I thought we had the power to reach right at the engine's peak horsepower RPM. 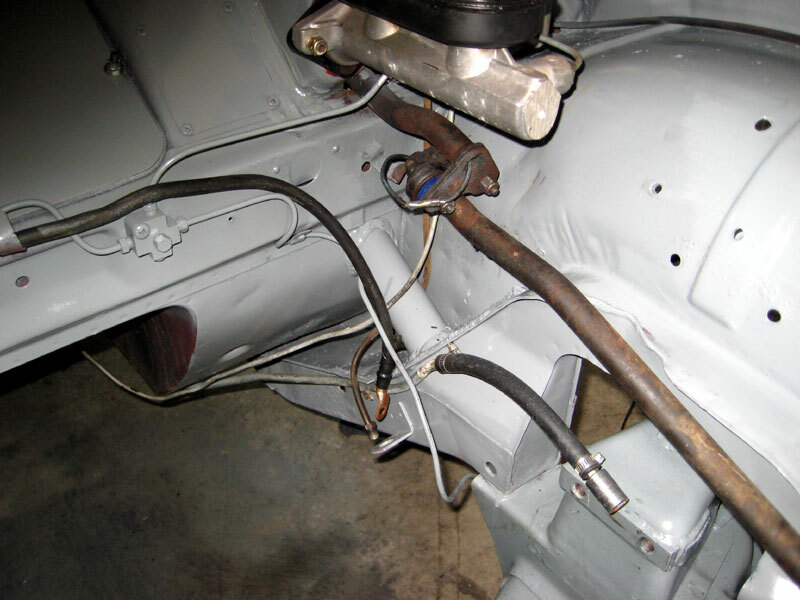 However, as fitted in a 122S, Volvo retained the long, vague "pudding stirrer"shifter while the 1800 series used a much crisper, short-throw stick further aft, so Mike cut the old tunnel and welded in most of the tunnel from an 1800E to accommodate that. The seating position is different between the two models, so the new shifter came up in a position that wasn't quite comfortable. We ended up adapting a Hurst stick that worked out just right. 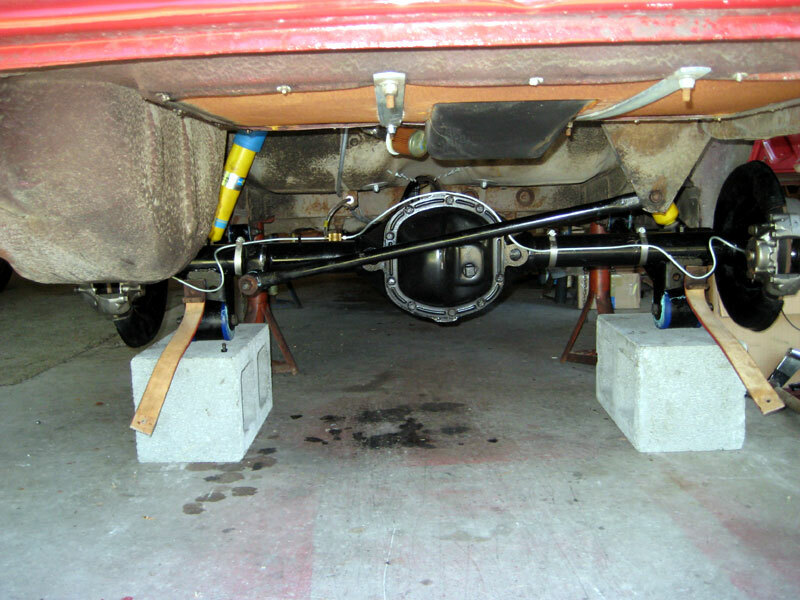 Drivelines Northwest in Everett made up a custom one-piece drive shaft, with two hefty U-joints instead of the stock two-piece shaft with three wimpy joints and a center support bearing. Simplicity is good in a racecar. Mike did some more slicing and dicing on the rear of the tunnel so the larger joint would fit. 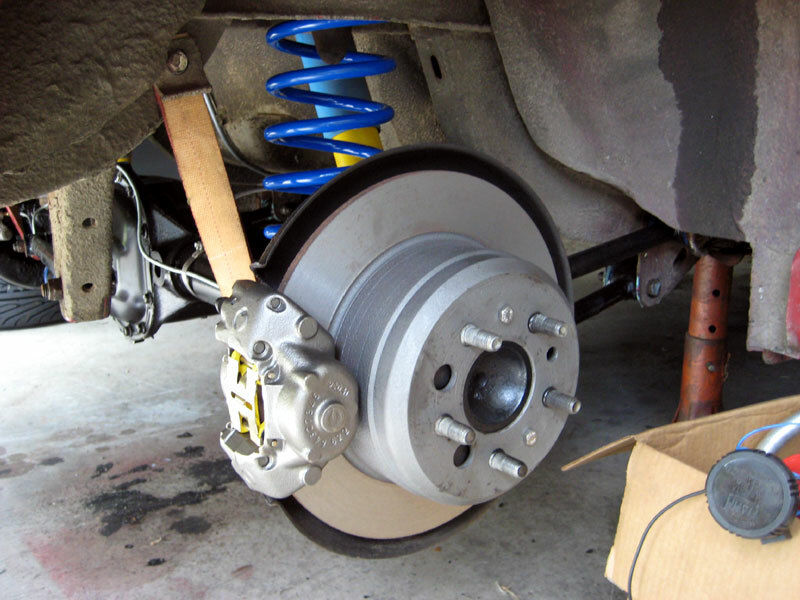 I'd gotten a lot of opinions and done a lot of agonizing about what springs the suspension should have, how stiff they should be, how much travel they needed, and how low the ride height could be without grounding the car on any topas, the huge speed bumps found in towns in Mexico. The options were limited, because unlike 1800 and 140 series Volvos, the 122S will not accept 5" diameter spring without considerable modification to the spring perches - 4.5" is it. I finally settled on the popular VPD street performance springs, which are progressive in front and linear in the rear. John Parker was very supportive and simply donated a set (and got a big VPD graphic on both sides of the car in return, although he hadn't asked for anything in trade), with slight stiffer than standard rears and shims so I could adjust the front height. With everything cleaned and repainted, I put the suspension back together with polyurethane bushings throughout and 1/4" shims in the front spring perches. All this was largely guesswork, but the springs ended up working out very nicely. I wanted to use Delrin bushings in the upper control arms, but found that those are no longer available. Mike offered to turn out a few sets, but I figured he already had enough else to do, and polyurethane would serve well enough in that location. This did not end up working out very nicely. Now it was time for brakes. Richard had some nice four-piston Wilwood calipers sitting in a box to fit the front, and adapting the brake lines was simple. Less simple was what brake pads to use, and much soliciting of advice and agonizing ensued. Normal street pads would be subject to fade and rapid wear at speed in the mountains, and most racing pads don't grip well until they get hot. Mike came up with the solution - he vintage races a BMW 2002, had just tried the new EBC "Yellowstuff" pads at the Maryhill Loops hillclimb, and loved them. They grip really hard, and work equally well hot or cold. A bit more research indicated that they are also long wearing. I then spent several days figuring out which ones would fit the non-standard Wilwood calipers, but the EBC was most helpful and we eventually came up with the answer. Then they made Mike a dealer, so we got them at a reduced price (although they were not exactly cheap, even at that). Replacing the wheels turned into a project. I had a thought of using some sort of alloy wheels from a Volvo 240, but none of those are strong enough to withstand hitting a big pothole at 100 MPH, which was a real possibility. The bolt circle we now had is used only by Volvo and one or two Italian exotics, so there weren't a lot of choices. The Targa guys I consulted unanimously said Panasports were the only thing to have, so we bought a set of five from Mike Dudek at iROLL Motors, which happened to be the last set on the continent in the size we needed (and no more coming for at least four months). A set of directional Yokohama 205/60VR15 tires from TireRack.com later, we had a roller. 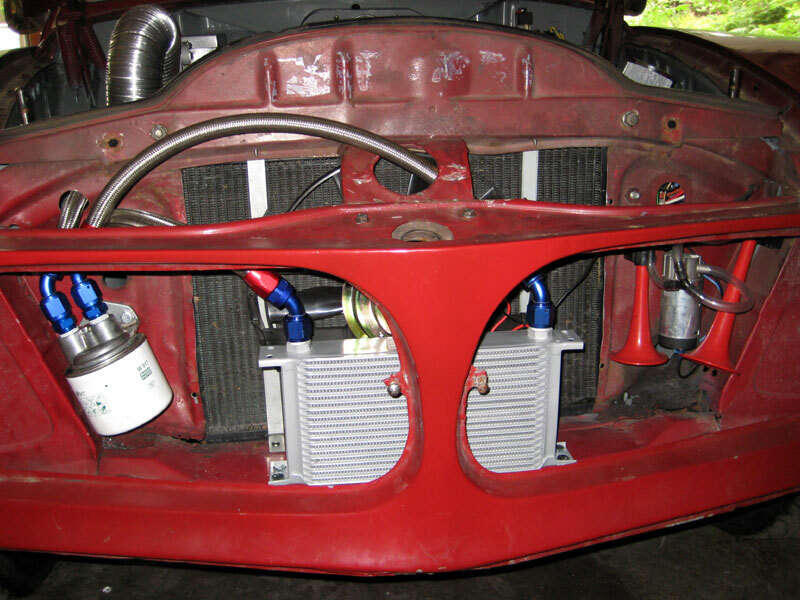 I knew the electrical system was a mess, and just how bad it was became even more apparent when I started disconnecting stuff in order to clean and paint the engine bay and interior of the car, now that most of the cutting and welding was done. I ended up tearing out everything forward of the seats except for the turn signal wires, and starting over from scratch. There was a perfectly nice Painless fuse block in the car not being used, so that became the heart of the new system. It seemed to me that, with some likelihood of transiting mountain back roads in the dark, the car needed something better than old sealed-beam headlights, so Daniel Stern Lighting provided a set of Cibie E-codes, with spare bulbs, relays, heavy-duty connectors, fuses and related items. These made the old Hella auxiliary lights redundant, and no more need for a front bumper to mount them on, the lights and both bumpers went away. A little bit of weight reduction here and there adds up. 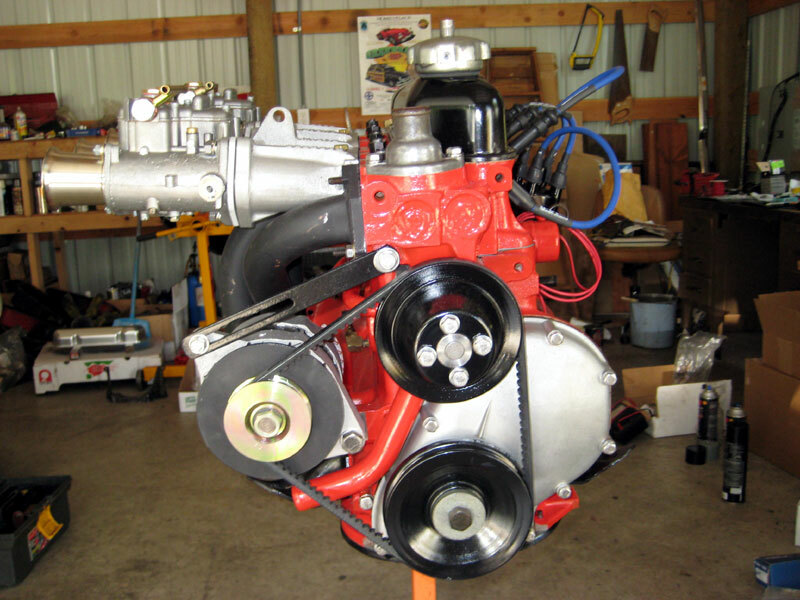 I installed a Carter electric fuel pump from Top End Performance to ensure adequate fuel flow to the new engine. For the clutch, I intended to use a later Volvo pressure plate, which has more clamping force than the original type, with a cintered friction disk of some sort - that would be an the grabby side, but Richard ought to be able to deal with it. One of the guys I'd been soliciting advice from then convinced me that this would not be adequate, and that he'd donate a slightly used, stiffer pressure plate to the cause for free. Having already spent silly amounts of Richard's money, I accepted. This was a bad move. After installing the engine, I found out right away that the Swedish header would not fit in the car. Mike took it to a friend who was able to heat it and bend it so it would. With that on, we were able to install the carbs and see how much inner fender needed to be cut away to be able to fit a cold air box. Webers badly need air horns to perform well (we saw a 15% drop on the dyno with them off), and there's not nearly enough room in an old Volvo for the horns with any sort of air filter over them. Also, performance suffers if the engine breathes hot air from inside the engine bay. The solution is to enclose the horns in a box, and somehow duct cooler outside air to the box through a filter. Mike took off a big hunk of fender, fabricated a new panel to fill the hole, we worked out a design for the air box. We couldn't duct it out the front next to the radiator because the remote oil filter would occupy that real estate, but we could duct it to the cowl vent in front of the windshield, and there was room for a large filter in the battery box (the battery had already been moved to the trunk). I left the details to Mike, who went off to his shop to fabricate the necessary bits and pieces. The radiator went back in with a new electric pusher fan in front of it, and I was then able to measure the space available for the oil cooler - I wanted the biggest one that would fit. That went on order at Pegasus Racing, along with adapters for mounting the oil filter remotely, Aeroquip hose, and a bunch of AN10 connectors. All that went together nicely once the parts arrived. With the car back on the ground, clearance between the header and the right upper control arm was uncomfortably close. I took the arm off the car and cut off as much as possible without weakening it. That was much better until I tried to do a wheel alignment, and found that I couldn't get enough negative camber without the arm hitting the header again. Off came the carbs, manifolds and header, which went to Mikes place for a cut and fill in the problem area. This gave us perhaps 1/4" clearance, and I've had street-driven cars with similar clearance go for years without problems, so I called it good. I put the manifolds back on with some very careful port matching, mounted the carbs, and tinkered together some sturdy throttle linkage. We had a minor snafu with the finished air box: it would fit in the fender cutout once installed, but first it had to slide over the air horns, and the cutout wasn't big enough for that - we couldn't install it. Mike tore out the panel he'd recently put in, enlarged the cutout, fabricated a new panel, and that was solved. He'd built the filter box to take some very common filter that should be available anywhere in Mexico if a replacement was needed, and all the rest of the system fit without any difficulty. The car was close to ready, but we were seriously pushing the deadline for completing it. I'd had two other large projects running in parallel all spring and into the summer, and hadn't been able to devote full attention to Richard's car until those left. The main hang-up at this point was the ignition system. I'd ordered a Crane XR3000 breakerless conversion and coil months earlier. I got the coil right away, but the electronic components still hadn't come. The vendor kept saying it was still backordered, but would ship directly to me from the Crane factory any day now. I couldn't get any answer from Crane after repeated tries (it turned out they were in the process of shutting their doors, but I didn't know that). The vendor wouldn't cancel the order because it wasn't backordered in-house, and they couldn't reach Crane either to cancel it there. I was spending a lot of time I didn't have searching the Internet for some other vendor that had this in stock - I'd just buy another one for Richard, and save the first one for some other customer if it ever came in - and not coming up with it. The exhaust system I'd taken off was the most cobbled together, badly welded, made of rusty pipes of assorted diameters thing I've ever encountered - more modern sculpture than a functional piece of automotive hardware. 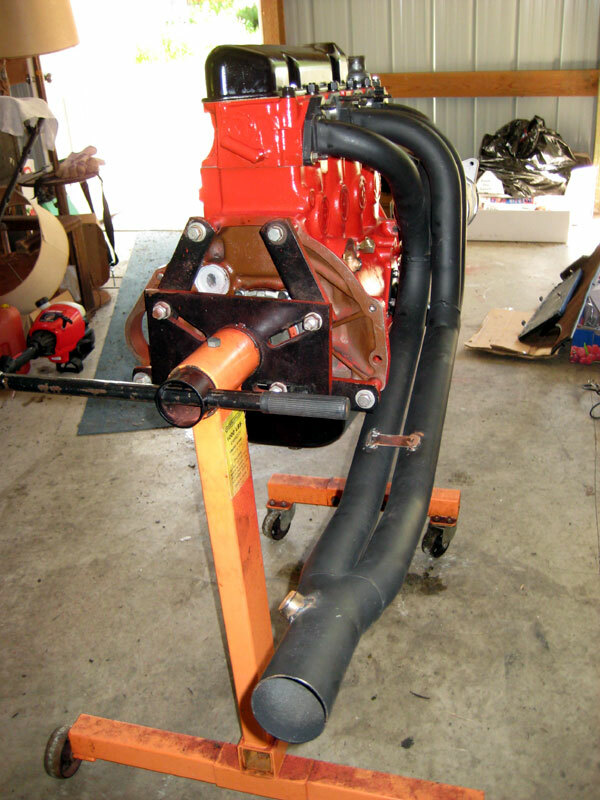 The new system was more straightforward: a 3" pipe slipped over the header collector running back under the rear axle, and with a single free-flowing muffler aft of that. We did a lot of gentle bending to get it tucked up as high as possible, but no sharp bends at all. A band clamp made a secure connection between the pipe and the header, while making the system easily removable. I put in a conventional coil and an old distributor with points, and the car was finally self-propelled, although this would not support the RPMs needed for the event. The new limited slip unit needed to be broken in with short runs of no more than 20 minutes at first, and its first trip to Mike's shop took just about that long. Mike fitted the car with an air dam made of high-tech, clear plastic that would flex out of the way and snap right back if it hit a big rock or grounded on a topa, which gave the car a dubious Wonder Woman sort of look, but so be it. He also sewed up new window nets of some miracle fabric that would be as strong as the old ones, but actually permit a view of the outside mirrors, and made up a boot for the shifter. While he was busy with that, I finally found some place that had the Crane ignition in stock, so that was on the way at last. It was now late August, the car needed to leave for Mexico in early October, and Richard would be busy all of September harvesting apples - Apple Farmer Racing is called that for a reason. That didn't leave as much time as we wanted to sort out whatever problems would inevitably rear their heads, and get enough miles on the engine to fully break it in. Richard was at my shop to pick it up before I was finished installing the new ignition - the timing was that tight. I ran it up and down our road once, and turned it over to him to take home to central Washington. 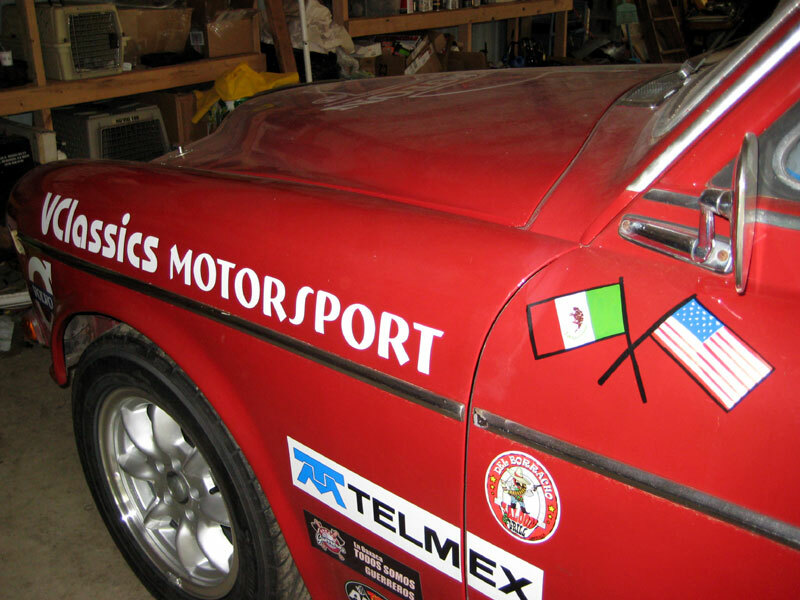 Richard installed a pair of NACA scoops in the air dam for brake cooling, covered the clear plastic with red, white, and green racer's tape (that looked much better), ran it up and down Mount Rainier a few times, loaded it in his trailer, and that's all there was time to do. In Mexico, on the eve of the first day of La Carrera, Richard qualified the car 19th overall, fastest in its Historico A+ class, and ahead of quite a few V8-powered machines, so we knew it was fast enough to win. However, problems arose right away on Day One of the race; problems we could easily have caught and corrected if there had been a chance to run it hard enough for long enough. The first was heat from the header melting the rear polyurethane bushing in the right upper control arm - we'd never gotten the header hot enough for that to happen. The crew installed a spare, and that promptly melted as well. They got by after that with stock rubber bushings and some header wrap. A much worse problem was the stiff clutch, which in turn bent various parts of its throw-out linkage, and wouldn't quit doing it. This caused missed speed stages, and a lot of misery for the crew, who once ended up lying under the car in a near-freezing puddle in the dark trying to patch it together on the night of Day Four. Eventually getting it into a dry, lit garage, they were up most of the night installing an alternate clutch of a different type, and then finding some of those parts were wrong and wouldn't work. Much of Day Five was missed putting together something that finally did work. With those problems resolved, Richard took fast time in class on Day Six, moving into third place, and closed on the second place car on the final day, but couldn't overcome the large deficit. 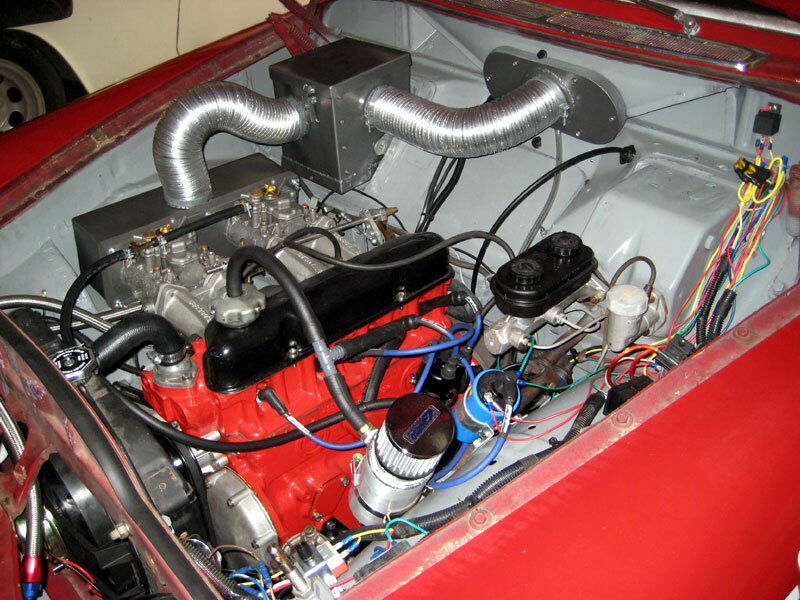 For 2009, Richard has fitted the car with a new header from Vintage Performance Developments, and a lightened stock flywheel with a different clutch. The navigator and crew are the same as last year, so everyone has experience with the race and how to get things done in Mexico. 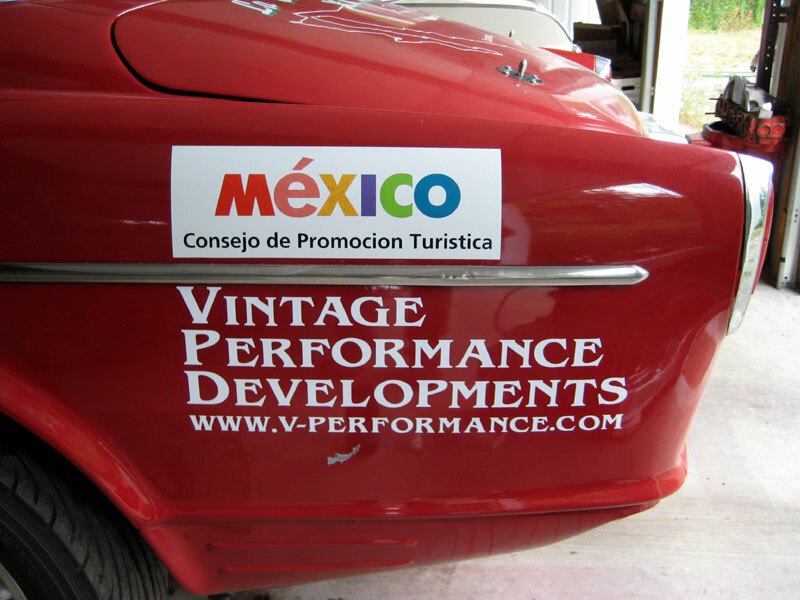 I think they'll do very well, but this is La Carrera Panamericana - anything can happen.